Just Send It! How I became obsessed with doing stupid things in crappy cars. When I first read David Tracy’s article about the Detroit Gambler 500 this spring, I thought, “That looks like an insane amount of fun. I’d like to try that someday.” Then I promptly forgot all about it. 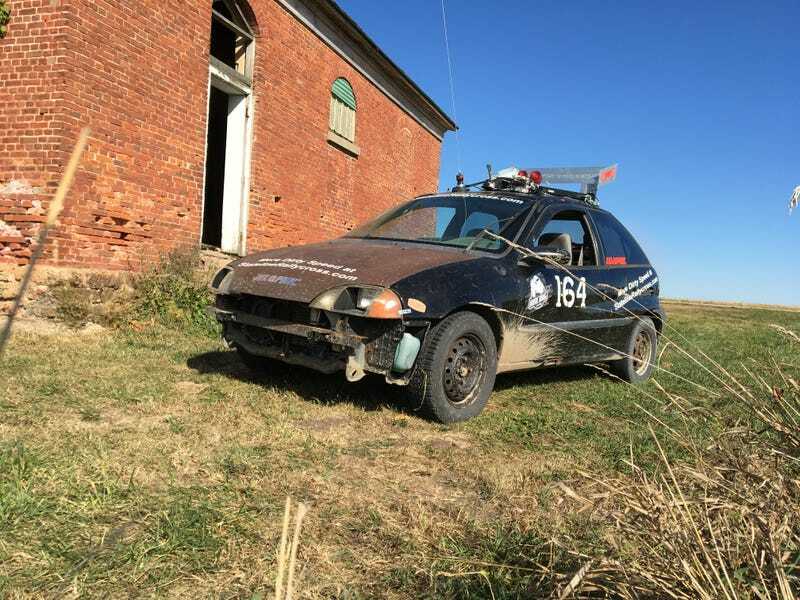 Cut to about a month and a half ago, when the owner of Stateline Rallycross contacted me, wondering if the Gambler 500-Illinois was on my radar, and would I and the RallyMetro be willing to represent Stateline Rallycross at it? It was not on my radar, but I was most certainly interested. Deals were dealt, preparations were prepared. Next thing you know, old Jed’s a millionaire. As the event drew closer, I gradually grew more and more excited. Honestly, the last couple days beforehand, I was kind of useless because all I could think about was the Gambler. Finally the day arrived. We rolled from my navigator’s house at 4:45 am, short on sleep but long on excitement. Once coffee was purchased, we headed west towards JC Whitney’s facility in LaSalle, IL. JC Whitney sponsored the event, and was letting everybody keep their tow rigs there over the weekend. When we rolled around behind the building, our eyes both popped open wide. It was a huge flotilla of the most magnificent crap-wagons you’ve ever laid eyes upon. It was glorious. Our excitement meters were instantly pegged at 11. We parked the truck and began unhitching the tow bar. We loaded a couple last minute things, I topped off the oil, and then I said to Navigator Steve, “You know, we never checked the tires.” Steve said, “You’re right. Well, there’s two on this side!” I was about to say the same, but then I noticed the left year was almost flat. We hooked up the 12-volt compressor to it, but the sidewalls quickly began bulging. We had to change a tire before we could register. Not a good start, but luckily we had brought two spares along with us. The first waypoint was an off-road park. I think it would’ve been hairy if it had been wet, but it hadn’t rained in weeks. The RallyMetro proved to be a little billy goat, and its small size was a definite advantage climbing over, through and around things. Now, I’m going to skip ahead a bit here. I literally wrote five single spaced pages and didn’t quite make it through day one. As much as I like to think I’m a decent writer, I don’t think anybody wants to read all that. As we went from stop to stop, we met lots of people, saw lots of hilarious amazing vehicles, talked to a lot of folks about rallycross, and traversed down many gravel, dirt, and grass “roads.” We quickly realized we were not in contention to “win,” but neither of us cared. We were here for fun and adventure, and we were finding it in spades. One stop was a “haunted” abandoned school house. While there we saw what we dubbed the Lincoln-Delorean climb a big stump for … reasons. We also hooked up with Andrew, Nugget, and Johnny in a Buick LeSabre with its roof sawn open. A couple stops later was the top of a hill leading to a heavily rutted dirt road. Several cars were parked at the top, including a Mercedes with a hole in its oil pan that they were patching with epoxy. We saw several people take one look at it, and turn around. We were enjoying a nice break when a Corvair on a Blazer frame pulled up and made my day (I love Corvairs, and I love stupid lifted cars, so this was right up my alley). “Pretty hairy, eh?,” she replied. “Perfect,” and then she motored on without another word, right around all the dudes scratching their heads wondering if they should give it a go. She showed them up by adhering the Gambler Motto: Just Send It. I’d been saying since we got there, that we had to try this. We had so much fun at the off-road park, and the car did so well, to me there was no question. Steve was up for it, but was enjoying the hilltop road party so much, he wasn’t exactly in a hurry. I went over to the guys in the Buick, who were positioned at the start of the road. They wanted to do it, but were worried about their rusty strut tower collapsing. That had already started, and been beaten back into place with a board and a hammer. I suggested that if we were going to go for it, we better do it now while we still have sunlight. They agreed and went for it. I doubled back to the RallyMetro, where I found Steve talking to a local NPR reporter working on a story. I talked to him as well, and then told Steve we needed to just send it down the road while we still had sunlight. Behind me the NPR reporter, Carl, hopped into the Corvair and we went for it. We tooled our way down it slowly, taking care to keep our little billy goat out of the ruts. We drove over a bridge that was built in 1915. This was turning out to be no problem at all. All of the sudden, the Corvazer popped out in front of me from the right. He had gone off into the farm field to pass me and was trying to get back on the road, when his left wheels dropped in a rut and he high-centered it. Steve and I stopped to help. We tried pushing it back and forth, but only managed to get it stuck worse. We found some branches and a few flagstones in the woods to jamb under the left rear tire to get it to bite, but no dice. I told the other guys that I had brought a recovery strap, in case anybody to needed to pull our clown car out of something. The idea seemed ridiculous. Pulling a stuck Corvazer out with a 58hp Chevy Metro that had 267k miles on it? Riiiiiiiiiight. Left with no other choice, Steve guided me back to where the ruts were shallow enough to cross, and I pulled into the field to line it up. The only tow points on the RallyMetro are up front, so we were going to have to pull using the feeble reverse gear. Our first attempt was a no-go. The Metro just kept stalling. We reset for a straighter pull. Carl and Steve were behind the Corvazer pushing as hard as they could, I revved up the 3-cylinders of screaming fury, dropped the clutch, and … IT MOVED!!!!! Much screaming, hooting, hollering, and high-fiving ensued! Carbonated beverages were consumed in celebration. There were no happier dudes in the whole state at that moment. This is what it was all about! The Corvazer driver decided to divert around the dirt road through a grassy area in the field. Steve guided me back onto the road, and we adhered to the other Gambler motto: Always Be Gamblin’. We did for a moment drop into the ruts and bottom out, but I gassed it and maintained momentum, and was able to climb up out of the ruts. We met the Corvazer at the end of the road, and the found the Buick guys there trying to fix the now fully collapsed strut tower with a hacked up a piece of tree branch put it in place with mechanic’s wire. It was too thick though to allow the tire to bolt back on. The driver of the Corvazer produced a battery powered grinder and cut off wheels. They hacked off the end of an abandoned sign post, and whittled it down until it fit in place. While they were working on that, a couple guys in an old Ford truck pulled up and the driver said, “Hey, is Tom here?” The Corvazer driver approached the truck and said, “Yeah, I’m Tom.” The driver said real serious like, “I’ve been lookin’ for you all day. I’ve got a warrant for you.” Tom turned white as a ghost, he may or may not have started stammering. Then the driver started laughing and said, “I’ve tried that three times today, I finally found a Tom!” We all started laughing, including Tom. The guy lived nearby and just wanted to come see what all the weird cars were doing and shoot the breeze. We saw a lot of confused looking locals as we were driving around, but we also got a lot of smiles and enthusiastic waves. Including from the nice Byron Police officer who had just seen me roll through a left turn arrow that went red on me. Once the Buick was “road worthy,” we moved out as a group. We made a couple stops to check the Buick for tire rubbing. It was a little, but ABG. Way behind, we pointed towards Cordova drag strip, where the group would be camping that night. We missed a ton of way points, and still were one of the last groups of Gamblers to arrive, but none of us cared. This had been an adventure that none of us would ever forget, and we were all grinning from ear-to-ear. Well, all of us except for Steve. He had passed out in comical fashion as soon as the last bit of light faded from the sky. Running the Gambler 500 has completely changed my perspective on our hobby. I was already headed down this path with the rallycrossing, but now I’m completely in. Every piece of crap car I see now, literally every single one, I think to myself, “Oh, that would be a good Gambler.” Right now, at the place I’m at in life, I’m not even interested in having a “nice” fun car. I want beaters. I want adventure. Always Be Gamblin’! Here’s a selection of additional potato pics for your viewing pleasure. This guy had just successfully driver through that gigantic drainage ditch. The CRV did make it back out as well. With the amount of bondo on this thing, I say there’s at least one zero too many here. I think this is my favorite rig from the weekend. Gamblers don’t read too good.